Just as promised, Intel have announced a huge number of Broadwell processors at this year's CES. Only these probably aren't the CPUs you're looking for. unless you're in the market for a new thin and light notebook. The new Broadwell U range follows on from the previous Haswell U lineup, which means another chip devoted to low power consumption. These Broadwell U chips are 15W and 28W dual-core CPUs in a variety of flavours, from Celerons all the way up to Core i7s. 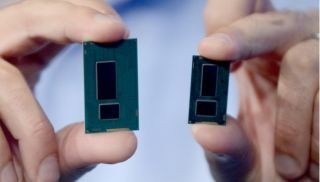 But these dual-core CPUs aren't the gaming powerhouses I'm hoping for from the new 14nm microarchitecture; the proper quad-core/eight-thread processing behemoths are being held back until "mid-2015", according to this latest Intel presentation. Speaking with a motherboard manufacturer in December I was told to expect the 100-series motherboards for Skylake—Intel's 6th Gen Core—at Computex in June. If that's still the case then the tardy desktop Broadwell chips could arrive at the same time as the first flush of Skylake processors. In that case it might make sense to skip a generation. Intel have been busy telling our TechRadar pals that Skylake is going to be worth the wait. Right now the only Broadwell chips you'll find are in notebooks, though the 5th Gen Cor GPU does take up a huge amount of space on these dual-core chips. That shows where the performance priority lies in these mobile parts. Intel suggests that the HD Graphics components offer up to 22% more gaming performance compared with the previous generation—not a bad performance boost from something that was only meant to be a die-shrink of an existing processor design. But while the graphics boost—and impressive extra battery life—means your work laptop will be a sleeker machine with a high-res screen, we'll have to wait to see what Intel's performance processor engineering can really do for gaming in the coming months.